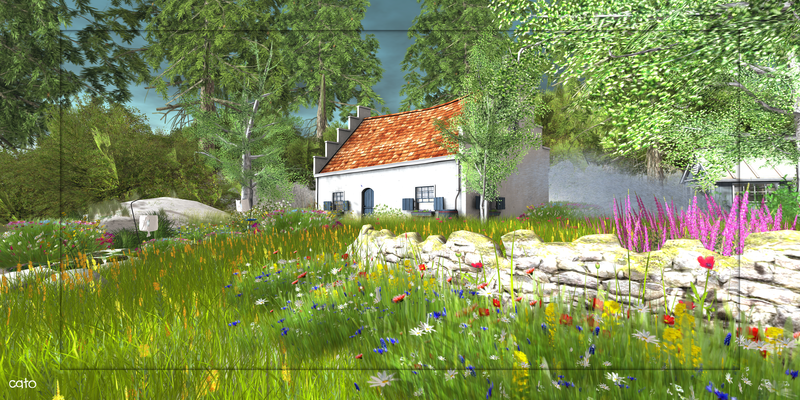 Today a blogpost without a slurl to the location featured…as this is about my private home, which I have completely redecorated the past two weeks! I am almost done, although one is never done in SL, and pretty pleased with the endresult and so I decided to put some pictures on my blog to show it off :). On the groundlevel I have put most effort and decorations in the garden, as I tend to ‘live’ outdoors anyway and hardly find myself IN the house. It’s why I choose a relatively small, one room, house – after all it is more for decoration. Since I have used a lot of stuff from my inventory I already had and also some new things, I will try to make as much as a complete list in the credits below as I can! Since I do not have banlines or a security-system and the land is in between Linden Road and Linden Ocean, I do get the occasional visitor walking by or in, which is fine as long as they are polite and behave….So for some sort of privacy – as far as possible in SL – I also have a skyhome which I mainly use to park myself when blogging, changing outfits or as a studio for photoshoots. I have my own office up there (it’s a mini skybox, rezzed on top of the larger one I use for studio), and it is the only ‘indoor’ room I have actually decorated and… it is quite different than the groundlevel! Just as I thought it would be….. a place of peaceful serenity..yet vibrant with color. Thank you for sharing… Cheers to a job well done!